Every publishing house declined to print Ira Trivedi’s debut book. Luckily, Penguin obliged. Today, after three books in eight years, every leading publisher wants a bit of her young, contemporary way of story-telling! After knowing about what she is now working on, the number of houses chasing her might just multiply. Coming to her first book, ‘What Would You Do To Save the World’, (Also the quintessential question asked at the beauty pageants), which she wrote at the age of 19 is inspired from her experience at the Miss India Beauty pageant, where she was one of the contestants. Her second book, There’s No Love On Wall Street mirrors the dark side of becoming an investment banker and the mad race youngsters become a part of in the process. The third book is The Great Indian Love Story which is about a girl from the small town who flies to the US. “In each of my works, humour is the only factor that remains intact. I like to prick people’s illusions - be it glamour attached to beauty pageants or prestige of being a prestigious banker. All that glitters is not at all gold, it has a dark side; I explore that in my works.” But then, at the same time, she chooses to project the brighter side of India through her books. 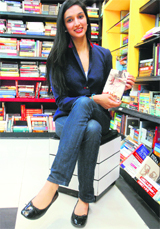 “The India of my books is urban, growing and new, something that youngsters can relate to. Readers from a very long-long time have been reading about the destitute people of India, why not present before them the changing face of the country?” she questions. Ira is glad about the literary scenario in India wherein a lot of first-time writers are getting breaks through publishing houses. “But at the same time, quality should not be compromised with. With so many authors, readers too have become selective about books; they can’t be fooled.” As is true with so many successful authors, Ira is also changing her book, The Great Indian Love Story, into a film’s script. “Cinema still has a mass appeal and the central idea of the book – love - too has it.” All the more reason to understand her shift from fiction to non-fiction, India in Love, “I wanted to look at the ways this emotion has changed over time; fiction would have limited it.” And non-fiction helps her look at it with a broader perspective! From the intense Pasupathi in the Telugu super-hit Arundhati to the chivalrous Rajkumar Sujamal in Jodhaa Akbar and the rustic, vengeful Chhedi Singh in Dabangg, he has juggled myriad of challenging roles in his career spanning a few years. Born at Patiala, brought up in Moga and having spent a substantial amount of his childhood at his aunt’s house in Jalandhar, Sonu Sood’s Punjabi roots still regulate his life and career. 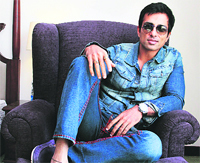 He borrows his humility from his mother, a professor whose childhood lessons taught him to stay grounded ‘no matter what.’ All set to play host at the PTC Punjabi Music Awards in Jalandhar on March 24, Sonu Sood spills the beans on his journey so far, his upcoming projects and what keeps him going strong in the big bad world of Bollywood. When I was a child, I had never even dreamt that I would be an actor one day. While pursuing an engineering degree at Nagpur, I got an offer for an amateur modelling show. I got noticed and soon made it to shows in Delhi. Then I was offered a film Down South and after this first Tamil film, other assignments started pouring in. What are you more of – the gun-brandishing, tattooed rowdy Punjabi or the more humble guy that you are usually perceived as? I am a bit of both. I proudly flaunt my Punjabiat, but when it comes to temperament, I like things more grounded. Glamour is attractive but humility has its own charm. You have thrived in your roles and been associated with the best of productions as well as entertainment houses. Maybe even more than some lead actors. Has it been a conscious choice? Yes I have been very choosy about by roles. Whatever the nature of the roles, I have chosen to work with big banners and acclaimed production houses. I have always wanted to learn. There were times when I sat idle for months, as I did not get a role of my choice, but in the end I have loved my decisions. Do you like the way your career is shaping up? Some of my characters like Chhedi Singh and Sujamal became household names. Arundhati was one of the biggest super-hits in the Telugu industry. What more does an actor need? What has been your favourite role so far? I love the role of a cop that I am playing in my upcoming film Maximum. It was a great learning experience working with Naseeruddin Shah. A baddie or a supercop - what’s your pick? A challenging role, be it good or bad, is what excites me the most. Maximum, Shootout at Wadala and some movies Down South. How is it playing Dawood Ibrahim? It took loads of research. I really worked hard for it. It’s going to be different project altogether. Will you be there in Dabangg 2? Nope. There have been a lot of changes. The director has changed and the spirit of this one is different, so I opted out of the project. “Indian theatre and films have retained the elements of social activism and express it directly to audiences and that’s what makes this genre the most powerful media,” observed Shashi Ranjan well-known Bollywood actor, producer, director and above all a socio-cultural campaigner. An alumnus of the Film and Television Institute Pune, Shashi had earlier done well in youth festivals of Kurukshsetra University while representing his Vaish College, Rohtak but never did professional theatre. Coming from a humble background of academicians, he entered the film world via Haryanvi films when filmmaking in Haryana was a rarity. 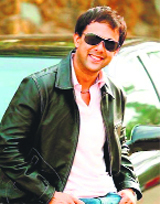 He, along with his friends, produced a film called Bahurani and played the lead role. Later, he was featured in Phool Badan and another film opposite Rama Vij. He acted in and produced many more films like Prem Geet, Zakhmi Sher, Saheb and Gali Gali Mein Shor Hai to name a few. Shashi, who was in Chandigarh for receiving a state-level honour conferred on him by the Haryana government, shared his journey from his home town Bhiwani to Bollywood. “Siyasat was probably the first movie dealing with politics with larger implications on the governance and the governed. I shot a violence scene with a15,000-strong crowd and the venue was my birthplace Bhiwani,” said Ranjan. The crowd was so involved that they braved the harsh sun to take part in the shoot while some crew members and actor Hangal fainted while doing that, he shared. Talking about his many firsts, he claimed to be a pioneer in introducing the first ever talk show with Shatrughan Sinha which made records on Zee TV and Star. “I had ventured to organise Indian Television Academy (ITA) as the founder president and introduced TV awards. Our contributions to social work on female foeticide project Beti now is in the 10th year. For creating awareness on female feoticide we have involved youngsters by giving them prizes on one-minute film on the subject. On the plight of regional cinema, especially in Haryana, he observed that the move has to be supported by the state government and influential organisations. “People appreciate quality cinema in their mother tongue. In the South regional cinema is more powerful than the Hindi cinema,” said Ranjan. History repeats itself — probably each one of us has borne the brunt of this line year after year during our school days! There wasn’t any respite from history for it would repeat itself after every semester. This time, however, Punjabi singer and actor Gippy Grewal goes on to tweak history or just a part of it with his upcoming movie Mirza, The Untold Story. Written and directed by Baljit Deo, Mirza is being presented by Emerging India Housing Corporation and Speed Surya Films. In Chandigarh, the team gets together to talk about the movie. Gippy Grewal in his ‘super-cool’ avatar can’t hold back his kid-like excitement. He has loads up his mind! Mirza, The Untold Story…what is that we don’t know about Mirza? The name of the movie is Mirza, The Untold Story but it is an entirely different film; it is a story of modern-day Mirza and a romantic action thriller. It definitely has some very basic resemblance to the Mirza, but it is a modern-day concept placed in a modern setting. More than half of the movie has been shot in Canada. So where does Gippy Grewal relate to the modern Mirza? This is a movie that has a lot of fictional elements. I relate to Mirza’s bravery, to his strength and determination. As far as the movie goes, I had to train a lot for it. I learnt martial arts and how to use weapons. Personally, I believe in the policy of ‘live and let live’, all the same I would never back-off if the situation demands me to stand up for myself or my near and dear ones. Punjabi cinema is doing well in the Steeple Chase (read evident hangover of Paan Singh Tomar over the audiences and Bollywood both). Will Mirza contribute something in the race? (Gippy laughs) Yes it will. Mirza, The Untold Story is going to be the most technically sound project of Punjabi cinema. The entire team of technicians is from abroad. The movie has been shot in Canada and movie-makers abroad have helped a lot. Baljeet Deo, the director, has treated the subject in a grand manner and there are a lot of similarities with Hollywood movies. How can I forget about the music? It is something that the audiences will remember forever! The music has been released by Speed Records and has 11 songs in total, out of which I have sung eight songs. We had roped in Rahat Fateh Ali Khan, Arif Lohar, Kamaal Khan and, of course, Yo Yo Honey Singh for the music. For the first time ever, I have sung a song with Sunidhi Chauhan in Dil Tera. Doesn’t it sound like something interesting? Let’s get this over. Agent Vinod is no James Bond. Sure he is suave, chic even witty and undeniably good looking. But a Casanova who can charm women out of woods and who sleeps around with voluptuous beauties, he certainly is not. Rather the first and the only woman that appears in his life, he pops off the big question to her. However, action is one department in which our spy matches the good old Bond….bullet for bullet. And come to think of it mind blowing action is what the movie is all about in any case. Of course, there is a narrative that begins on a promising rather menacing note in Afghanistan. Raghavan who showed great potential in films like Ek Haseena Thi and Johnny Gaddar seems to mould this one too on an exciting note. And as the hi-octane storyline flits from one county to another, thrills become one too many and the pace becomes supersonic to keep track of. So much so you have to constantly nudge yourself to remain clued in. Not that the movie decodes Newton’s new laws. Yes the code 242 keeps surfacing and resurfacing for you to keep wondering and guessing. But before you think here’s Bollywood’s answer to Hollywood, it meanders around. Bombs and terrorism are what it zeroes down to. And nuclear bomb, the new threat hovering over mankind, is what our indigenous agent is after. So, you have him tracking it all over the world from Russia to Morocco to Pakistan and finally India. Only by the time he discovers it, you couldn’t care less. Nor about the epilogue to the movie which is who are the real masterminds behind terrorism? In between, of course there are moments and characters that keep you engrossed. Ram Kumar, the burly new passionate romantic of small screen, gets a new avatar and almost pulls it off as baddie. Adil Hussain and many others like the evergreen villain Prem Chopra are good. The lead pair surprisingly displays no chemistry, though fit into their parts with convincing ease. The much touted surprise package Maryam Zakaria’s role is too brief, despite the well done mujra, to make any major impact. As for the film, superbly edited in its action sequences in particular, impresses in fits and starts. Just when you can say kudos to Raghvan’s brilliant writing and crisp one liners (yes he has written the film too) he does a somersault and Bollywood clichés beep loud and clear. The romance angle, the Pakistan connection and the overzealousness to clear its involvement in terror attacks go on to create a potpourri that’s different and yet not refreshing enough. Watch it if action has your adrenaline pumping. Only remember this one comes with Bollywood tadka. The story begins with a series of seemingly unconnected events, all over the globe. In Uzbekistan, an Ex-KCG officer is murdered. In Cape Town, a group of international business tycoons discuss a rumour that the dead KCB officer had a nuclear suitcase bomb hidden away. In Moscow, an Indian secret agent is exposed. The agent is shot dead while trying to send a red message to India. In India, the head of RAW sees the incomplete message. All it contains is a number 242. Agent Vinod (Saif Ali Khan) is the kind of agent who first kicks the door open and then finds out what’s behind it. His unconventional approach puts him in dangerous situations, but he manages to get the crucial leads. A series of twists and turns take Vinod across the globe from Marakkesh to Riga, Karachi to Delhi and finally London. The movie is full of suspense and action; and you feel if blink, you would miss something. Both Saif Ali Khan and Kareena Kapoor do justice to their roles. The on-screen chemistry between the real life couple Saif and Bebo is electrifying. Saif looks tough and cool, playing a spy. The movie has a Bond touch but overall it is a fun ride. The music is entertaining and so is the concept of the movie. Saif Ali Khan plays his character with elegance which makes it more powerful. Kareena looks gorgeous as usual and now it feels she has learnt a bit of acting as well. Fresh, fun and spirited are the key words for Lemon Tree Hotels, and, a brief visit to their newly-opened branch at Industrial Area I, confirms that. Fresh lemony whiff welcomes you as you step into the premises (their signature fruity lemon fragrance), the interiors are perky with lemon and green, funny quotes and short narratives adorn the tablemats and the walls. The regularity of the flooring is broken by interesting logos here and there and many of the rather young staff support ponytails with yellow bands. This 81-room hotel pegs itself as moderately priced, upscale and full service facility. With rooftop infinity pool, gym and a mini spa, the hotel offers special orthopedic mattress as well as ergonomic chairs and rooms that are light and sound-proof. Each room has safe deposit lockers and yoga mats. Slounge offers a social drinking place that comes equipped with a pool table and PlayStation. “Lifestyle today is hectic. And, we really lay stress on offering the best bed, breakfast and broadband,” says Rahul Pandit, president and COO, Lemon Tree Hotels. Citrus café serves an eclectic all-day menu. A rapidly rising Indian chain, Lemon Tree group aims at making its presence felt all across the country (they are already in 16 cities). Business and profits aside, the group also aims at more inclusiveness in society. “Employing speech and hearing impaired staff is our way to bring together otherwise much divided society,” says Rahul. Besides, the hotel, also adopts a street dog in each of the properties. Lemon Tree offers bed and breakfast at introductory price of Rs 2,699. There are various techniques used by designers to display your nick-knacks around the house. Here are a few basic tricks you can use to style and display your stuff beautifully. n Triangles: This kind of a display is pleasing to the eye and reads the display from the top to the bottom left and right, and then back to the top. The triangle display enables the eye to perceive the group as one whole instead of each individual item separately. n Grouping: For a triangle to be effective you need to group your items properly. Pick out the tallest item you want to display and place it at the back. This item will be the top point of your triangle. Now, add mid-sized items in front of the tall one. Make sure they overlap a bit of the tall item. If you want you can add even smaller items in front and sides of the mid-sized items. n Repetition: Repeating similar items can also look attractive. If you have a collection of similar items, line them up together in odd numbers to create a stunning display. Although this is not a triangle, yet you need to keep your items close together. n Empty Space: If displaying two or three groups on the same shelf or table, make sure you leave appropriate empty space between groups. This will help the eye to focus properly on each group without causing confusion. n Keep it simple: Don’t try to display everything at once. Store some and keep changing them throughout the year. 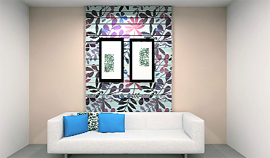 n Background: Don’t let the backdrop interfere with your display. Busy wallpaper, for example, would distract your attention from the object you’re trying to highlight. Most often, a soft, solid colour serves best as a background, though a bold colour is in order if the object is pale. This definitely comes as good news for chocolate lovers. No more worrying about the calorie count or the tiny pimples that appear overnight after the sweet indulgence! Chocolate is no more likely to cause pimples than a non-chocolate treat. There is no evidence that chocolate triggers blemishes. In fact, a new study suggests that there is a connection between your diet and complexion. The fact is that acne-causing ingredient isn’t cocoa, but the problem is sugar and other high-glycemic food that the body burns fast. And guess what? Dark chocolate is actually a low-glycemic food. But milk chocolate has a slightly higher glycemic index, so all chocolate lovers now know that they just need a minor fine-tuning of their taste buds to enjoy both tasty chocolate and good skin. So, to have both yummy choco and good looks you need to know the Glycemic Index (GI) of the chocolates, select the one with low GI, provided you do not eat up the entire box. From one interesting myth to another, how many times have you been told by your grandmother or mother to avoid sugar if you don’t want to see the acne. In recent years the medical community has largely dismissed the idea that any particular food causes skin blemishes. New studies, however, are beginning to show a link between breakouts and diets heavy in high-glycemic foods, including highly refined carbohydrates like white bread, pasta and potatoes, as well as sweets like doughnuts and jelly beans. It does appear from the initial studies that there maybe a role for reducing refined carbohydrates in both treating and avoiding acne. After this sugary delight, here is another one, studies show that a low-sugar, low-refined-carbohydrate diet that reduces the level of insulin in the blood and also lowers the level of androgens, a hormone that stimulates the glands in the skin to produce oil and, hence, acne erupts. While you needn’t fret that one chocolate caramel will end up on your chin in the form of a big pimple, you’re best off limiting the total number of chocolates you consume and sticking to dark chocolate. Not only does dark chocolate have less fat, it has antioxidants that can help reduce blood pressure and confer other health benefits. The auspicious Basanta Navrathri or the Vasant Navratras are here and it is once again time to celebrate food, which is fit for feasting as well as fasting. Though we always talk about what’s on offer, how many people actually bite the bait of ‘fast’ food presented by the hotels and restaurants during Navratras? “We have at least 10 guests on a daily basis who come and have Navratra food,” says chef Ankit Sharma from JW Marriott. Presenting a fare that would include a starter, two main dishes, kuttu ke atta ki puri or roti, cut fruits and desserts, Ankit says, “It’s usually more women who eat fast food, but overall there are many takers.” Well there must be, that is why we have almost all restaurants coming up with innovative dishes! “I stay as a PG and during fasts restaurants are a blessing, as I get food easily; I just don’t have to rely on fruits and milk,” says Vasudha Walia, who works for a MNC in Mohali. 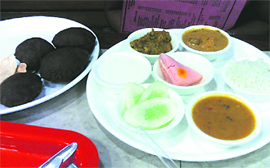 “Sometimes we are not even ready with the fare and people are seated to taste it,” says Priyanka Bajaj from Sindhi eating joint in Sector 17. She adds, “It is a misconception that people don’t eat out during fasts. Office-goers come in during lunch time and then there is a huge rush from six to seven in the evening.” Though there are many specialties, we also see fusion food (read sizzlers, salads, dosas etc) being prepared for fasts. “A lot of people fast during Navratras and almost 15 to 20 per cent eat out,” says Rajee Kakkar, group general manager, Hotel Western Court. He adds, “Keeping in mind the number of people who eat out, restaurants prepare the meals and there are takers, which is why these meals are prepared.” That’s the point! Kareena Kapoor is awaiting the release and response to action thriller Agent Vinod which stars her and Saif Ali Khan. They hope to receive a bumper opening. Priyanka Chopra is shooting for Barfee and is personally planning her best friend Tamanna Sharma’s wedding which will happen in April. Katrina Kaif is in London shooting for Yash Chopra’s romantic film with Shah Rukh Khan. The film will release in November. The shooting of Dhoom 3 has been postponed due to Aamir Khan’s wish. Ranveer Singh is in Bengal shooting for a period romance called Lootera with Sonakshi Sinha. The film is directed by Vikramaditya Motwane. Crowds often gather to see them on set. Kalki Koechlin is shooting for Yeh Jawaani Hai Deewani at an outdoor location and she has a supporting role in the film. The film is directed by Ayan Mukerji and Ranbir and Deepika are the lead pair. Ali Zafar has been successful with his innings in Bollywood. He is currently shooting for David Dhawan’s remake of Chashme Baddoor and is loving the jhatkas and matkas and commercial comedy in the film. Actress Priyanka Chopra is riding high professionally. But as far as her personal life is concerned, she hasn’t found her Mr Right. Meanwhile, she is busy planning a hen party for her best friend Tamanna Sharma’s wedding. Professionally, the 29-year-old actress is reported to play Jaya Bachchan’s character in the remake of the 1973 blockbuster Zanjeer and has been offered 11 crore for the role. Well, that’s a huge sum. It was a rare occasion when the stars of a movie had to go out of their way and stop a wedding so that the crew could commence with the shooting. During the shoot of Viacom 18 Motion Pictures and Wide Frame Pictures’ Kumar Mangat Pathak and Abhishek Pathak’s movie Bittoo Boss in Shimla, actress Amita Pathak and actor Pulkit Samrat had to go to a wedding close to the shooting venue and stop it. A scene of the movie was being shot in a hotel and just close to it a wedding was taking place. The sound of the band-baaja hindered with the shooting. So Amita and Pulkit decided to take charge of the situation and went to the wedding posing as reality show hosts. They asked everyone to stop the band from playing and took interviews of all the people present for 2-3 hours till the scene was being shot in the hotel. “It would have obviously been quite awkward to tell them to stop the wedding because we are shooting a movie scene in the next hotel. This way we just kept them busy,” says Amita. The crew and the cast members then joined the wedding celebrations. Danced and wished the newly-wed couple and wrapped up the day. “I loved the tikkis they were serving there,” quips Pulkit. After the scene was shot in the hotel and Amita and Pulkit were informed about it, the two young actors thanked everyone at the wedding and told everyone the truth. All the people at the wedding got very upset and felt conned. “Their anger was understandable. Amita and I tried to pacify them. Some of the crew members also came to our rescue. We then spoke to the bride and groom and asked for their forgiveness. The couple saved us from being beaten up for sure,” says Pulkit. There used to be huge crowds everyday on the sets of Lootera when Ranveer and Sonakshi were shooting in West Bengal. At times almost, reaching about 1.5 KMS from the location of the set. And for every shot the crew had to lock-up the sounds and ask for everyone to keep quiet while the shot was in progress. Lootera is a grand Diwali offering from Balaji and Anurag Kashyap’s production company. Looks like love is finally blooming for Shahid Kapoor! After stories of him dating Nargis Fakhri, it has been reported that she has moved into his house. Buzz about them started when they went to Goa together for Shahid’s birthday. Nargis has been linked with Ranbir Kapoor and Shayan Munshi. Shahid has been linked to Priyanka Chopra, Vidya Balan, Amrita Rao, Bipasha Basu, and Anushka Sharma in recent times. His public relationship has been with Kareena Kapoor in the past. Well, we wish Nargis and Shahid a happy romantic future together! Legally Blonde star Reese Witherspoon and her production partner have snapped up the film rights to the much-hyped children’s book series Pennyroyal’s Princess Boot Camp. Actor Imran Khan is going through a complete makeover as an actor with his upcoming film Matru Ki Bijli Ka Mandola being a challenging project. Apart from physical changes in look et al, Imran will be using abusive language. It may not be shocking that Vishal Bhardwaj’s next movie, Matru Ki Bijli Ka Mandola will be as pastoral as his previous ones, and foul and abusive language will be employed abundantly, just like in his earlier works like Omkara and Kaminey, for example. Our source informs, “He is all set to get rid of his chocolate boy image for something more raw and rustic. He’s sporting a beard and has put on weight to even look older for his character in the film. Vishal is currently shooting for Matru Ki Bijli Ka Mandola at Wankaner palace in Rajkot. The movie is directed by debutant, Supavitra Babul and will release on April 13th, 2012. The music of the movie is composed by Raghav Sachar and the lyrics are written by Kumaar. The movie also stars Anushka Sharma who has won appreciation for doing fun roles. Bollywood actress Shazahn Padamsee, who will soon be seen in multi-starrer comedy film Housefull 2, says she always wanted to work in an “out and out masala film”. The 24-year-old started her career in Bollywood with 2009 release Rocket Singh and later went on to do Dil Toh Baccha Hai Ji opposite Ajay Devgn. “I always wanted to do these kind of films. This is an out and out masala film that has all elements of a quintessential Bollywood film. There is so much fun and crazy humour here. Moreover with songs, dances and feel good moments, it makes for a perfect family entertainment,” Padamsee said. Housefull 2 is directed by Sajid Khan and is a sequel to the 2010 release of the same name. The movie hits screens on April 5. The film will see veterans Randhir Kapoor, Rishi Kapoor and Mithun Chakraborty sharing the screen space with actors Akshay Kumar, Asin Thottumkal, John Abraham, Zarine Khan, Jacqueline Fernandez, Riteish Deshmukh and Shreyas Talpade. Kareena Kapoor has had her shares of action films with Ra.One, Bodyguard, and now Agent Vinod. She has fun shooting with Saif Ali Khan and doesn’t intend to do an action film for a while. She prefers the romance and drama genres. Saif has always wanted to make a thriller film with a spy theme and he wanted me to be part of this so I did this. I don’t enjoy jumping off building so I have not done that in this movie. My action scenes are more intriguing than that. This is my last action film. Saif was also keen that I highlight my eyes in this movie and we have done that. It is a glamourous role. I had a great time shooting in exotic locations. I like films that challenge me and help me grow as an actress. I love romantic comedies and drama. I am looking forward to seeing Titanic in 3D as it is one of my favourite films of all time. Farah’s acting debut: Farah Khan is making her acting debut in Bela Sehgal’s Shirin Farhad Ki Nikal Padi. Boman Irani enjoys shooting with her as she is funny, witty, and has loads of trivia. When Parsis get together, it is madness! Priyanka Chopra has been named Glam Diva by BIG CBS Love channel. She beat Vidya Balan, Kareena Kapoor, Deepika, and others to the top spot! She looks like a contemporary princess! Anushka Sharma is furious at being linked with Suresh Raina and says she is single! She says she only watched the final match of the World Cup last year with MS Dhoni’s wife and is not inclined towards cricket or even aware of who exactly Suresh Raina is! After making thrillers such as Johnny Gaddaar and Agent Vinod, Sriram Raghavan will move to science fiction and make a movie called Happy Birthday. This movie was supposed to be made earlier than the others. Kareena Kapoor doesn’t like being compared to anyone, especially Vidya Balan. She says that they both do completely different films and it is unfair to compare them. She likes Vidya as an actress, though. Sachiin Joshi gathered a decent share of critical acclaim through his debut film Aazaan. Hailed as one of the most technically brilliant films made in Bollywood, the movie even fetched the newbie a Stardust Award. Taking his quest further, Sachiin is now all set to star in his next project Mumbai Mirror with none other than glam sensation Mallika Sherawat opposite him. Sachiin plays a quirky cop in this realistic commercial potboiler, while Mallika essays the role of an irresistible dance bar queen. The movie mirrors the Mumbai underbelly and revolves around the nexus between powerful corrupt dance bar lords and the Mumbai Police. Directed by Ankush Bhatt, of Bhindi Bazaar Inc. fame, Mumbai Mirror has music my Anand Raj Anand. Shooting commences April end and wraps up in three months. “Mallika and Sachiin make a very unique and fresh pair. Mallika is the apple of the teenage eyes, and her chemistry with daredevil Sachiin is sure to create a hullabaloo,” says the director. Sumeet Raghavan who is famous for his comedy timing is off fiction shows as he is working on his new show - The Late Night Show. After the Internet show Jai Hind became a hit, he hopes this weekly show on colors too is a success. Shivani Gosain of Sahara One’s Piya Ka Ghar Pyaara Lage is going through a divorce but she manages all the chores like a dutiful daughter. Her friends feel she does everything a man can do be it earning or taking care of her house. Issi Ka Naam Zindagi on NDTV India this week will see Boman Irani as the guest. Arshad Warsi came on the sets and talked about Boman imitating Elvis Presley. Without any tantrums Boman quickly dragged Arshad and both of them shook a leg on the tunes of an Elvis Presley number. Discovery Science brings a new series Heavy Metal Task Force that features the world’s most technologically advanced machines that take on the most incredible and dangerous engineering challenges. Discovery Science’s Heavy Metal Task Force drills deep underground, slashes through ice and covers miles of distance while exploring some of the world’s toughest, biggest and meanest machines. The show will premiere on Discovery Science every Friday at 10:30 pm starting from March 23. Vivan Bhatena is enjoying hosting and will soon be hosting the upcoming Big Star Awards. He feels anchoring is cool and loves interacting with the audience. Risk factor: After his Marathi film, Sharad Kelkar is enjoying playing Dr Ashuthosh in Kuch Toh Log Kahenge. He feels that accepting new challenges and different roles gives an actor a lot of depth. He is glad people still recall his earlier shows Saat Phere and Bairi Piya. Vishal Singh aka Jeet Ahuja and Rashi aka Sparsh Khanchandani of Parvarish feel the bond of a father daughter between them on the show. While Vishal makes her comfortable on the sets Sparsh looks up to him like her father. Friends gather to honour you on your birthday and family functions. Be sure to invite all of them and avoid leaving anyone out. Stay out of ‘between two friends’ situations, especially if they are ‘emotionally unhappy’ for any reason. You should be careful with money and postpone all major decisions for another time. Ruled by number six and the planet Venus, you are energetic, cheerful, trustworthy, dynamic and methodical. You’ll give someone you trust a difficult task. You’ll be very pretentious, but patient; don’t be oppressive. Those with strong Saturn won’t compromise; they’ll be particularly stubborn and this will lead to tension. Loud arguments will solve nothing and will wear you down. If you really believe in yourself, don’t let anyone force you to change your plans. Friends who will not see things the way that you do will cause big problems. Improved finances will make you spend more on luxuries and other comforts. Legal or property disputes will settle around the middle of the year. Your ESP is in fine shape and you are able to save, solve and serve your family members quite nicely. Your gullible side is out, especially over monetary issues of any kind. Your health might be poorer than usual and you could catch frequent colds. You’ll tend to ignore health problems. Try to avoid anything that might affect your osseous system, skin, nails, hair and gall bladder. Also pay attention to your eating habits. Health of an infant will cause stress and anxiety. Venus moves into your sign this week, opening the doors to some surprising moments in your love life. Lucky days: Friday and Sunday. Lucky numbers: 2, 10, 21, 22 Lucky gem: Diamond, Solitaire, Zircon ,Emerald. Lucky flower: White Rose. Suggestion on birthday: Donate cooking gas or cylinder or utensils or shoes to the needy or at a religious place. Emraan Hashmi (March 24, 1979, Mumbai), known as serial-kisser in the Bollywood world, made his movie debut in 2003 with the film Footpath, which did not do well. He and co-star Mallika Sherawat shot to fame with Murder. He later appeared in such films as Zeher, Aashiq Banaya Apne, Kalyug, and Gangster. His number 6, which denotes Venus, will always help him get in romantic roles. SAGITTARIUS: Do not put undue pressure on yourself to take on unwelcome tasks. Indulge yourself in simple pleasures of life. You will be able to correct mistakes with important projects. Tarot message: Balance and perspective will lead you out of problematic Situations. Lucky colour: Brown. Magic number: 39.